From right to left: Dhia Habib, Percy Lynsdale, Karim Allawi, Nassir Chico, Shaker Ismail, Salih Faraj, Saeed Easho, Hama Peshka, Jamil Abbas, Toma Abdul-Ahad, Adil Kamil and Wadud Khalil. What do the sons of a former British Army officer, an Eastern Orthodox priest and an Assyrian Levy soldier all have in common? Answer. They were the three men that shaped the first ever-Iraqi national side in 1951 for their tour of Turkey. Prior to their call up, the central Iraq Football Association situated in Baghdad had been playing warm-up matches under the name of the Montakhab Baghdad (Baghdad Select) however with the date of the team’s games in Turkey closely approaching, three of the most talented young footballers in the country were incorporated into the team. The first two to be selected were the Basra based duo, Saeed Easho and Percy Lynsdale of the Basra Port Club. The third player Aram Karam came from the RAF base in Habbaniya. With the inclusion of the trio, Montakhab Baghdad became Montakhab Al-Iraqi, the Iraqi national side. Centre half Saeed Easho was the son of a Eastern Orthodox priest, who had settled in the city of Basra in the early 20th century from the heart of the old Ottoman Empire. Saeed excelled at football at his primary school in the district of Al-Ashar and at Thanawiya Al-Basra and was chosen to play for the Basra Select side while in school, taking on British Army sides based in the city during WWII. He had left the country to study but returned to work as a clerk for the Basra Petroleum Company (B.P.C.) and the Basra Port Club. His team-mate, Percy Lynsdale, also a clerk, was a tricky outside left with an instinctive eye for goal. They played together at both Basra based teams in the district of Maqil (spelt Margil in English), where Percy’s family had settled. Percy’s father had come to Iraq after WWI as an officer in the British Army and settled there after finding work in Iraq’s developing railway industry. He married a local woman and the family lived in Baghdad until Percy graduated from college and left the capital to live in Basra. The third player was the sharp shooting inside forward, Aram Karam, a man with a reputation for scoring goals from near impossible angles. The inhabitants of RAF Habbaniya once witnessed the player score with a thunderous drive from as far out as the centre circle. His goalscoring exploits became legendary and after a friendly game organised by the FA in which he netted two goals, selectors demanded his inclusion in the new national side. However they believed Aram, whose parents had been born in Iran, was an Iranian subject and was not initially selected. It was only after a group with connections to the FA travelled to Habbaniya and confirmed with the player that he held Iraqi nationalisation that he received a call-up from the FA. The trio were expected to line-up together against the C.C. Team at the Scouts Ground, but selectors decided that Aram would play for his own team. The C.C. Team were made up of mainly Assyrian players living on the Civil Cantonment on the RAF base in Habbaniya. The C.C. Team were thumped 5-0! They played together for the first time against the Basra Select side in Basra, and managed a 1-1 draw. Two of Basra’s players Shaker Ismail and Karim Allawi that day caught the eye of the coach Dhia Habib, and were added to the squad bound for Turkey with the two other players from the city nicknamed the Venice of the Middle East. The Iraqi team played two games in Izmir and Ankara, losing both. The first game, the coach decided to drop Aram and play the quartet from Basra, but they found themselves 4-0 down at half-time. Aram was thrown on in the second period and won a penalty. However he blazed it over and three minutes later the Turks had scored a fifth and went onto add a sixth and a seventh. Aram started the second game against the Ankara Select and after the home side had opened the scoring after only two minutes, the explosive Aram scored Iraq’s first ever goal against a foreign team a minute later, and then added a second on seven minutes. Turkey equalised a minute later but Aram went down the other end to net his hat-trick and put Iraq 3-2 up after 12 minutes. But that was the best it got for Iraq, and by the end of the first forty five minutes, Iraq were 4-3 down and even though Iraq added two more goals in the second half from Aram and Salih Faraj, they lost the game 7-5. It was their last game together. The Iraqi team returned to Baghdad and Saeed and Percy left to study abroad while Aram stayed in Iraq to play for the Iraq Petroleum Company in Kirkuk and eventually immigrated to the United States. 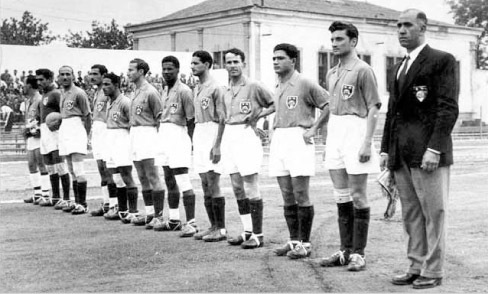 The sole survivor from the 1951 team Jamil Abbas went onto captain Iraq in their first full international against Morocco at the 1957 Pan Arab Games in Beirut. Great article. These are stories you won’t be told everyday but they are part of our great footballing heritage. Keep the articles coming brother. . I am writing because the coach happens to be my husbands grandad. I was hoping to be able to contact you to see if you have any information about him as the family has lost touch.